1. Social / Cultural Dimension - I started seeing that your chess pieces are like family members and significant others in your life that you try to protect the best you can. We are all alike (black or white in chess) and we try to move and communicate in ways that will support our mutual goals. Unfortunately though, you end up losing the ones you love. 2. Medical/ Physical Dimension - In order to maintain a healthy body we must maintain a balance of moving (exercise), eating (our opponents pieces), and resting (knowing when not to move). 3. Mental/ Emotional Dimension - Chess forces us to think really hard about our actions, the consequences of our actions, and how our behavior affects others and the world around us. It also gives us opportunities to experience and deal with emotions - like anger, revenge, grief, and joy, etc. 4. Educational/ Occupational Dimension - Chess develops our attention span, concentration abilities, and memory - so that we can learn, be trained and skilled, and maintain satisfying work experiences. 5. Spiritual/ Religious Dimension - I didn't notice a spiritual side to chess until one of my pawns first got transformed (born-again) into a Queen. At that point, I realized that our weakest members in life have the potential to become our strongest heroes. Chess also develops our faith in a set of organized beliefs and practices much like religion. 6. Legal/ Financial Dimension - Chess teaches us that there are consequences for not obeying the law (not playing by the rules of the game). There are also rewards for logically and systematically making the right moves in life. 7. Self-Control/ Higher Power Control Dimension - Chess teaches us that even though we may follow all the rules, all of the time - we do not have total control of our destiny (who wins the game and who loses). As Thomas Huxley so eloquently put it in his famous quote above ("the player on the other side is hidden)." What value to your life has chess provided? What are your beliefs about chess and the meaning of life? Steven Winer (2430) won the open section of the September $10 Open on Saturday with 4 of 4 points. Carey Theil followed in second with 3.5. David Vigorito had a draw with Carey and a loss to Steven. In the U1900 section, Mike Griffin (1758) ran the table for 4 of 4 points and a clear first place. Seth Lieberman was second with 3.0. 30 players entered the tournament, one of the most popular at the Boylston Club - a great bargin for your chess budget. Time for my weekly preview of the Boston Blitz (3-2), this time up against the hapless Philadelphia Inventors 1-4. The Blitz have pounded on this team, leading the all time series 5.5-0.5! Furthermore, the Blitz are coming off a lopsided win against the best of the West, the San Francisco Mechanics, while the Inventors are still licking wounds from their run-in with the NJ Knockouts. Here are the matchups. The Blitz have white on boards 1 and 3. First, a few questions about the Blitz lineup this week. Usually, a few people are unavailable from week to week, forcing Phelps's hand in the lineup. I can only assume Larry or Eugene is unavailable this week for Board 1. Otherwise, I would think the Blitz would want to play what I consider to be their strongest lineup, the one that defeated the Mechanics last week: Christiansen, Sammour-Hasbun, Esserman, and Krasik. But perhaps they have specific matches in mind this week, as we'll see below. At any rate, since the Inventors are battling for last place, it probably doesn't matter-- this lineup still looks like a winner for the Blitz. Before I go to a board-by-board breakdown, let me pause to ask-- where's Eugene? It seems that having him on the roster would be most useful to fill in when Larry or Jorge are unavailable, but so far, he is the only Blitz member not to play in any matches this year. The fact remains that as long as Larry and Jorge are available to play, Eugene doesn't fit too many Blitz rosters because of ratings concerns. I could also understand the 3-GM team if they had a very talented lower (but under) rated player that allowed the 3-GMs to play all at once (I count Jorge as a GM of course). As it stands, I wonder if adding a talented underrated player to help grant more flexibility on Board 4 instead of including Eugene this year would have been a better choice. Board 1 Jorge has white against Kudrin. Jorge is coming off of his second Game of the Week Honors for his two-wave attacking victory over Pruess last week. GM Sergey Kudrin doesn't like to lose, but he also barely likes to win, having drawn most of his games for the Inventors. 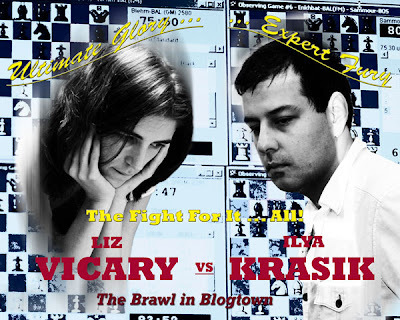 Interestingly, GM Kudrin has played THREE current members of the Blitz in a USCL matchup, all last year! 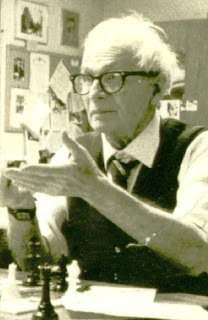 He drew Eugene Perelshteyn with the White pieces in week 3, and he drew with Larry Christiansen with the Black pieces. In a twist, he also drew Marc Esserman when Marc played Board 1 for the Miami Sharks for the single match (the only one he played last year) against Philly. Kudrin doesn't lose much, and neither does Jorge. A draw looks almost inevitable here. Board 2. IM Vigorito (Black) vs. FM Bartell (White). Following ratings alone, Vigorito must have a slight plus over Bartell. But let's look at their recent performances. Bartell just had a decent result at the NJ Open this month, getting nicked for two draws by 2200-level masters and a draw with eventual tournament winner Molner. David Vigorito probably hasn't been playing his best chess this year, but he did have a fairly decent New England Masters (only 1 loss in a strong field). In the New England Open, his only loss was to teammate Shmelov, but he suffered a couple of draws to both stronger and weaker players. However, IM Vigorito has drawn his two USCL games with ease (see: here or here), in one case, with a clearly superior position. Given that both have had solid but not spectacular recent performances, I'm going to predict a draw here as well, especially after wins start appearing on the lower boards. Board 3. Shmelov (white) vs. Costigan (black). This is a rematch from last year, when Denys won but perhaps was worse early on (I haven't analyzed this, shooting gallery!). Historically, Shmelov has been great for the Blitz, while Costigan's record is mediocre at best. 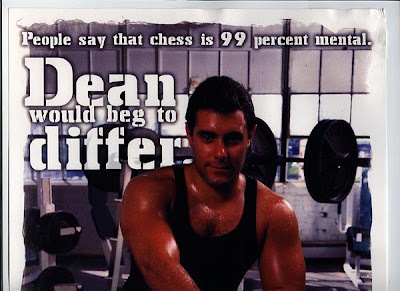 Looking at Shmelov's recent tournament results gives conflicting results-- A tie for first at the New England Open is offset by a poor performance in the Manchester, NH September Swiss, in which he coughed up two draws to players in this reporter's rating range (2000). Costigan, meanwhile, has only been munching on a steady diet of rapid tournaments. I have to like Shmelov's chances to reprise his victory over Costigan from last year, especially as the Blitz have proven themselves to be adept at preparing well for their opponents and showing good teamwork (securing draws where useful, for example). Board 4. Ilya Krasik has Black against Bengtson. In an effort to make my poetry efforts tougher, Philly has a Costigan on Board 3 and a Bengtson on Board 4. Here is where Ilya should avert his gaze if he doesn't want to see what I am going to predict. Surprise, surprise. I think Ilya is going to win this week. 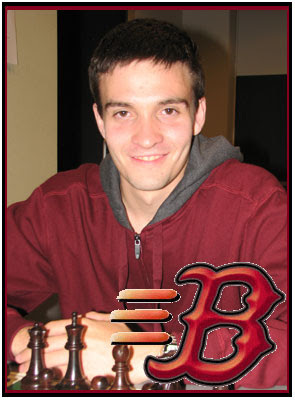 Bengston has not been stellar on Board 4 for Philly, and he has played in zero USCF touranments since 2006. Ilya has been putting together a decent season for the Blitz on Board 4, has shown excellent preparation for his opponents, and has now compiled a 1.5 out of 3 record that certainly should have been 2 out of 3. I should also mention his last tournament, in August, was a good result, including a draw with Foygel. I fully expect to see Ilya win this week, cementing the victory for the Blitz against the Inventors. To predict anything other than a win for Ilya (despite the spike in commenting a predicted Ilya loss brings with it) would be just dishonest to facts as laid out before me, folks. I still fully expect him to show off his special brand of lively invective in our comments section this week, so stay tuned! GM Ken Rogoff is a McCain advisor. Could a grandmaster be part of the next administration? Possibly. Kenneth S. Rogoff, a professor of economics and public policy at Harvard University, is an adviser to the Republican presidential nominee, Senator John McCain. He is also a grandmaster. Rogoff said that he has known Senator McCain for years. Rogoff said an understanding of chess had helped him learn economics: "The whole logic of game theory, which is a big part of economics, came easily to me." Knowing chess also helped him in his career, he said. "I was the chief economist of the International Monetary Fund from 2001 to 2003, and you are involved in a lot of high-stakes negotiations," he said, "and chess teaches you to think about what the other person is thinking." 30 second poetic summary of B.B. 's 3-1 win over S.F. 1. Last week Larry lost his queen. Thought his opponent was pretty mean. 2. Pruess prudently punctured Jorge's 1st Jorrible Attack. Pruess proudly pointed to his pawns -- sacked? Pruess plainly pummeled by Jorge's 2nd Jorrible Attack. Probably preset path when Jorge's opponents have Black? Whose opponent said, "Rook? Let's Sackik." Wednesday night has some compelling individual matchups when the S.F. Mechanics take on the Boston Blitz in Week 5. It also features the classic battle of differing team strategies -- top heavy teams like the Blitz vs. balanced 2300-2400 rated teams like the Mechanics. Boston is coming off what appears to be their most lopsided loss since the 3-1 drubbing in the 2006 Playoffs against the NY Knights, a long time ago. However, a closer look at last week's match suggests a much tougher battle than the final score indicates. 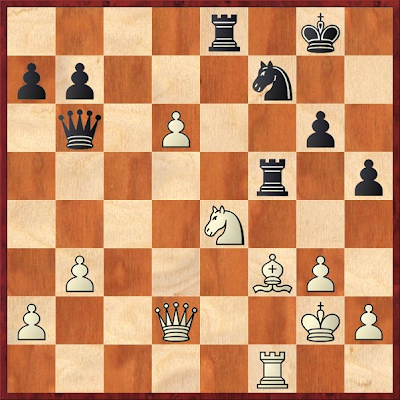 Larry's early piece blunder (see: Benjamin vs. Christiansen), in addition to making us all feel better about our own blunders (my own occuring as recently as last night), also destabilized the rest of the Blitz's boards, forcing Denys and Charles to overstep in sharp positions. (see: Shmelov vs. Ippolito and Molner vs. Riordan.) In short, it increased the pressure on the lower boards to come up with full points against staunch opposition. Boston must be careful to shake off these last losses and play with a short memory and renewed vigor. Several factors play in Boston's favor. As a long-time professional chess player, Larry's play will be uneffected by last week's crash-and-burn; he has seen it all before. Jorge can anchor any team's Board 1, and he is just a shark in the Board 2 position. Newcomer Marc Esserman fits into the Blitz's team makeup perfectly -- underrated at 2307 after obtaining two IM norms this year, including an impressive one in Miami two weeks ago (for more, read: Esserman's take on Miami). Underrated players anchoring Boards 3 and 4 were keys to the Blitz's last year success (and key to the top heavy lineup strategy), when Denys Shmelov and Chirs Williams took up the reigns of the bottom boards. However, the Mechanics are a young and dangerous team, with their top boards born in the 80s and their bottom boards born in the 90s! Youngsters = hunger + underrated + continual improvement + crazy and dangerous games. Let's look at a Board by Board breakdown. Board 1. Bhat vs. Larry C. In last year's San Fran match, Larry captured the Game of the Week with his very fine victory over the one time Boston local GM Patrick Wolff Christiansen-Wolff 2007. 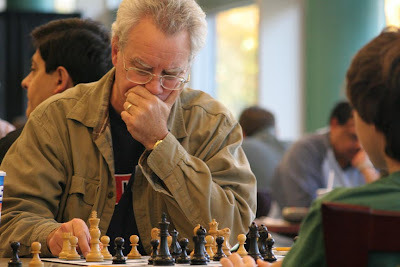 Meanwhile, Bhat was on Board 2 last year, and scored a victory over Bill Kelleher. 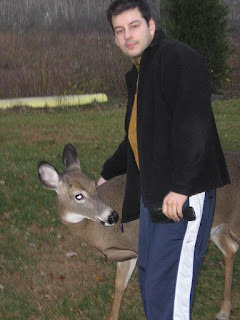 Bhat-Kelleher 2007. My database is silent on any games these two may have played-- I can't find any previous games. So how can we decide what might happen? Looking at Bhat's 2007 record reveals that not a single game was drawn and he won most. But this is Board 1, and Bhat's opponent is one of the US's best GMs. I'll predict a draw after Larry steers a rabid attack into calmer waters. This will be a good result for the freefalling Blitz. Board 2. Sammour-Hasbun has White vs. Pruess. David Pruess has had a string of mediocre (for him) tournaments this summer that pulled his rating from the verge of 2500. He also had a ho-hum 2007 season. Jorge is one of the fiercest players in the league and is the reigning 1st-team All Star for Board 2. They are also playing this week at a faster time control, which only adds to Jorge's advantage. Prediction: Jorge brings home a needed point for the Blitz. Board 3. Shankland vs. Esserman. What happens when two up-and-comers face off on the critical Board 3? A bloodbath. Sam's league record is excellent with an 83% winning percentage, mostly on Board 4. This year he is holding Board 3 nicely, as well, with wins over Philly's Costigan last week and Miami's Galofre the week before. He has also been playing well recently over the board, including a first place win over the Labor Day weekend against other masters. I've already discussed Marc's exploits. I'll go ahead and predict that Marc and Sam will scrap and punch and claw until their bare kings are dancing around each other. Draw. Board 4. Krasik has White against Naroditsky. Oh, no! What shall I say about this game? Somebody in this picture is caught in some headlights this week, and the person behind the wheel of the oncoming car is a 13 year old, World U12 Champion. Daniel Naroditsky isn't even allowed to drive, of course, but check out this brute-tastic victory from last week. Or this one from the week before. But it isn't all doom and gloom for Krasik and the Blitz-- Naroditsky is still a bit uneven, as in this game from three weeks ago, and last season he struggled a bit (he was 12!). I still think this game is going to be more like those first two and not like the third one. It doesn't help that it will only be 5:00PM on the Pacific Coast when this game is played-- no chance for Ilya to draw the game out past Daniel's bedtime! Ilya can be crafty, to be sure, but I still can't justify predicting anything other than a loss. So, to sum up-- hard games on all the boards. A draw is a fair and just result, but all the boards are in the balance this week, and it could go either way. During our analysis an excited Harry said "I think you have something here." He got up and returned with an index card to write down our analysis. I was proud that Harry felt this was such a feasible idea that it made it into his personal chess archive. Most strong players of those days had their own personal archive of openings on index cards. Jackie Peters lugged around a thick 3 ring binder breaking down his openings ,analysis, and percentage of performances against rivals in his records. How did/and does the distribution of chess knowledge get to chess players? 200 years ago one learned to be good at chess by playing against good players in the divans of France, England, Germany, or the US. Although there is evidence that chess books have been around since about 650 AD and publishing picked up in the 1400'ds, dissemination of chess information was slow. In the early 1800'ds newspapers started publishing chess columns. In 1851 the first international tournament occurred in London won by Adolf Anderson. Chess was becoming popular but only a few dedicated folks mastered chess in this information starved environment. A clique of masters would travel from one international tournament site to another and they became the creators of the current chess theory. Many of them wrote for various newspapers and tournament books and so information out to the public broadened. In the very early 1900'ds, legend has it that a young mediocre player Akiba Rubinstein disappeared from his school studies to figure out the secrets of chess by himself to return as a strong player (kind of like the Michael De La Maza story). But records show Gersz Salwe coached him. I think the 1909 and 1914 Saint Petersburg tournaments (where the first "official" grandmasters played) is a good milestone for the beginning of type of environment that passed on chess information for most of the rest of the last century: tournament chess books, chess newspaper articles, people could make a non gambling living playing chess and became professional and international celebrities. 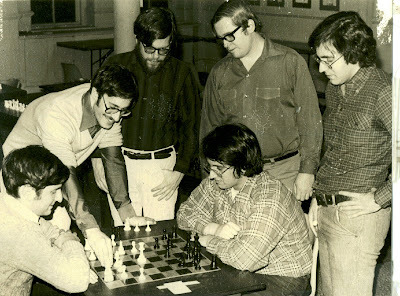 Openings like The London System, Cambridge Springs, Carlsbad, are names of openings/formations related to the tournament's name, where practically every participant would try their twist on a particular opening at the tournament. Clearly these masters were on the bleeding edge of chess theory had a feel for what was new in chess. The rest of the world tried to wrest information from their games and publications. In early in the last century in the Boston area, many players like Harlow Daly would visit the Boston Public Library and hand copy interesting games from the newspapers. And so it went in the US, there were a handful of classic books by world champions; tournament books; magazines like the American Chess Bulletin, Chess Life, Chess Review, becoming Chess Life and Review, New in Chess among others. In 1933 Ruben Fine edited a US version of Modern Chess Openings. Local papers of major cities had their chess columns. Fred Reinfeld and I.A. Horowitz in the middle of the century began turning out many mediocre books aimed at the beginner and middle strength player, although they did write a few gems. In 1966 the Chess Informant came to life to become a major contributor. Chess information to the public was expanding. The government of the Soviet Union sponsored chess and the biggest chess system known to man evolved organizing play, teaching, and developing chess theory. In time, emages would spread knowledge throughout the world. The Fischer era had an infusion of British and Australian chess books into the US in addition to domestic publishing. People were saying that more chess books were published than all other games combined. Still what was published was usually behind what was current theory. Masters that occasionally traveled widely would pick up ideas, sometimes the hard way, and could apply them when they came back home with great effect. 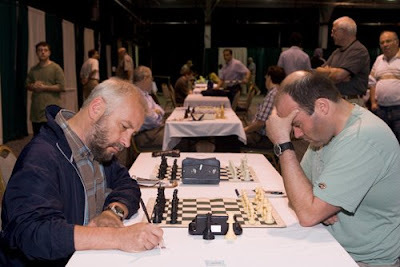 Active players in major urban areas had the advantage to be involved in a large pool of the chess population, as compared with someone in an exurb who had to rely on correspondence chess to face talent. The index card was the major storage device of most player's personal chess knowledge. Then BOOM everything changed when the PC and Internet arrived. Chess players no longer have to be near a city that had a chess environment to play challenging games or play correspondence chess; today everyone has equal access to the Internet and computers. Milestones, for the average strength chess player, are 1986 for the 386 processor and computer programs that were beginning to consistently beat good chess players; and 1992 with the introduction of the Internet Chess Server (ICS) and other online resources. Today you also have the chess databases with millions of games and many thousands of other chess related sites on the web. My personal estimate is that there are 60K to 80K people playing chess on the internet every day. Immediately everyone can see what grandmasters are playing. Now we are able to enter a position onto a board and quickly call up all the games in a database that have had this position and select what games you want to play through, in order to see how the masters handle a specific position. And with our own games we can store them into a database and have the PC analyze for blunders and make recommendations; our own personal coach. We can analyze our opponents games and cook up surprises. No longer do we have a chess knowledge vacuum; it's information overload. We are in chess pig heaven. The BU Open is coming up. Mark your calendar and preregister! Cash Prizes: based on Entries. In past years the prize fund has been more than $1000 and the first prize around $300. Allan Ong Prize for the top undergraduate BU college student: Trophies for 3 player teams: Top college / Top high school / Top elementary or middle school. 871 Commonwealth Ave., Boston University, Boston, MA 02215. For the Blitz fans, a nice set of annotations from the Kenilworth chess club is linked below. 1. Given Larry's early blunder, should Shmelov have allowed the draw anyway? Several of us watching at the BCC thought Shmelov's 17. Qe1! was a shocker, and maybe?! a good decision based purely on the chess position. A quick draw would have put a lot of pressure on Charles (and Marc) to pull out 1.5. On the other hand, see point 2. 2. How much of Charles's late game decision-making was due to the match score? If Denys had accepted the draw, does Charles take "safer" routes to steer the team to a tied match? Where might those safer paths have been? 3. Does Marc Esserman's game contribute to Smith-Morra Gambit Theory? Will his next opponents be willing to accept the gambit after what looked like an effortless victory for Marc's Smith-Morra? In response to the constant ugly bickering that our comment section has become, all comments are now moderated until further notice. There will be some lag between your comment and when it becomes accepted. I apologize to those considerate regulars who post frequently, but under the current conditions, I have to delete or edit nearly every other post. I no longer have the patience to patrol the schoolyard non-stop. Here are my hidden predictions, revealed! 1. Marc wins. Take the missing letters now bolded below and arrange. Since the boards look very evenly matched, I think most people might think a draw. Voshva, who was having a good event as well. notch a win on Board 1 against anyone, even with the Black pieces. 3. In the White Space, in white text, I wrote "Larry is going to draw." You could see this by highlighting the white space with your cursor. I THINK LARRY IS GOING TO DRAW, but who really knows. I'm not Nostradamus! If Board 2 were a arm wrestling match, the Knockouts would have a huge advantage. Remember, though, that Shmelov has been very good to the Blitz over the chessboard. 4. I misspelled some letters below. The correct letters spell Molner. What about Board 3? Charles has been busy with Law School, so his chess playing has been on the backburner. 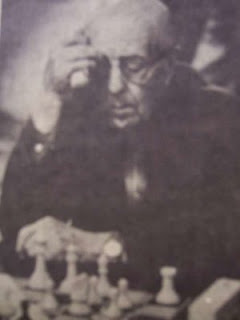 NM Molner, however, has been only so-so in his US Chess League history while Charles has pulled out soMe tOugh wins when the BLitz needed him iN the past. Games But, Watch out, Charles. A closEr look shows Molner's 3.5 out of 9 history is mostly due to a poor 2006 season. Last year he impRoved a lot Molner's USCL history. This season, Molner is 1.5 out of 3, losing only to the strong IM Voshva. So there you have it. My predictions of course are not affiliated with the Boston Blitz, and I am only making them in good fun. Good luck to the Blitz this week. The phone rings and Bernardo Iglesias' voice is at the other end. The mass transit T Red Line has an interruption in service and there is a bus shuttle between Park & MIT stations. This is commuting death: shuttles can add an hour each way on to the commute to the club. When this occurs players south of Boston are hard pressed to make it to the BCF tournament. Although we urban warriors prefer mass transit we adapt using Plan B which is Griffin Taxi Service (aka Dad's Taxi): I drive my car. We contact south shore players that might be interested in playing and we rendezvous at the Quincy Adams train station and carpool to Somerville. Typically Bernado and Scott Didham are passengers, in his playing days Mikhail Derazhne also occasionally went with us. Several years ago when the BCF moved from Clarendon street in Boston, one reason why we chose Elm Street in Somerville was because of improved automobile parking as Boston parking had been getting more sparse and expensive. One of the many squares of Somerville, Davis Square, has many parking lots and on the street parking, albeit 90% of the spots have a parking meter with a two or three hour limit. Consequently the most critical non chess factor of many players participating at a BCF tournament is to REMEMBER TO FEED THE METER! Game 60 time controls seem to have a more synchronous interval to the meter schedule, while non whole hour time controls make the task more complex. Invariably while one is decompressing after a game the last thing to come to mind is the meter; therefore you get a $30 ticket attached to your windshield. It happens to everyone sooner or later. Somerville has some of the best looking, most persistent, madly maniacal meter maids in the world. 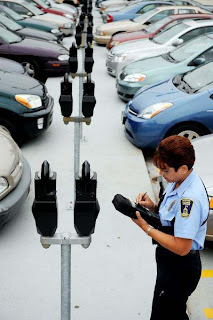 They say chessplayers have good memories, but these meter maids are aware of the time status of all the cars parked in their responsibility; because invariably the moment you are out of time they nail you with a ticket. It always seems you are only five minutes late when you finally do remember that your other time has expired, and rush out to your car, to sadly realize you've been tagged again??? Do you have any Meter Maid or chess commuting stories? Wednesday night's KOs vs. Blitz match is fast upon us. You know what that means--- it is time for me to preview the match, make a few predictions, and stir up the masses of comments. What about Board 3? Charles has been busy with Law School, so his chess playing has been on the backburner. 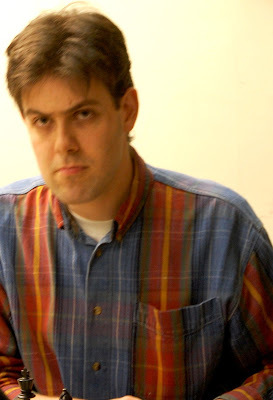 NM Molner, however, has been only so-so in his US Chess League history while Charles has pulled out sone tuugh wins when the Biitz needed him ip the past. Games But, Watch out, Charles. A closar look shows Molner's 3.5 out of 9 history is mostly due to a poor 2006 season. Last year he imptoved a lot Molner's USCL history. This season, Molner is 1.5 out of 3, losing only to the strong IM Voshva. A Quad tournament is where you get to play a round robin with three players close to your strength, a three round tournament. Swiss tournaments are the norm in the US, but excluding class specific swisses, you are going to face people variably stronger or weaker than you. In an Open Swiss, masters arrive knowing that they might only have one super difficult game, the last round, and will face weaker players gradually getting stronger throughout the other rounds. Some players take a strategic first round 1/2 point bye to make easier work in the tournament: sleep in, one less game to work thru. For strong players: play slightly weaker players longer than they would with normal entry. And for weaker players the plus is: not get a random one point bye thus wasting unscheduled time waiting for the next round. Usually monthly the BCF has one weekend Quad (game 60) runs all day, and could have as many as 3 Wednesday night "Early Bird" Quad tournaments (G/30) that go from 6pm to 9:30pm. The Quad is a cool format because you are going to play three challenging games against like strength players. If you come to BCF Quads on a regular basis you will be facing many of the same players as you did in the previous quad. So you can prepare for these games, and the games take on a higher level of enjoyment and quality. Chess, unlike in the rest of life, it is morally ok and very satisfying to seek and exact vengeance. What would your ideal chess tournament be? How do you feel about strategic byes? The Boston Blitz fell tonight to the Dallas Destiny in a heartbreaker of a match. Perhaps someone can assess for me the timing of when the games ended, because that will perhaps explain some of the decisions in the other games. Also, let's see how my prognostications went. The problem here to my mind is that the Bishop on e7 is now practically out of the game and leaves a bunch of dark squares weak behind it (see the a7-g1 diagonal). 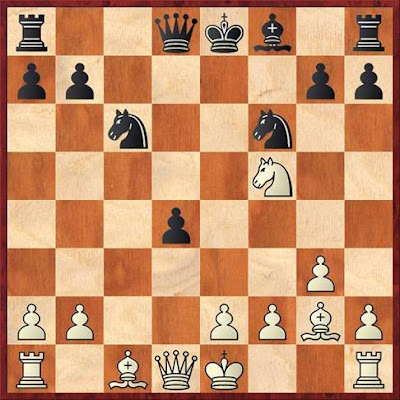 The Knight and Queen quickly exploit that diagonal plus the outpost on d3 to force a draw. More analysis will be needed(I'd like to hear Jorge's take, of course), and I believe Black has some time trouble, but I thought 30.Qxf2 instead of Nxf2 was a way to play for a win. I had predicted a win for Jorge, but I didn't get it. I could possibly get half credit, but the Blitz wanted a win not a draw on Board 1 tonight, and Black could have maybe pressed more at the end?! 0 prediction points for me. Board 2 I know I mischaracterized David's game1 draw in my last post, but perhaps even he will agree that this time he held a pretty safe and comfortable draw throughout this game. Bartholomew-Vigorito White had only minimal chances to open the Kingside, and David put the kibosh on any funny business. How did I do? Well, I predicted a draw, but I thought maybe it would have been tougher than this. 0.9 prediction points for me. On Board 3, Shmelov-Schneider, I understand Denys wanted to play against the French and opened with 1.e4. I thought in the early part of the game Denys had maybe a slight plus, but shortly after 16.g3, Black had a bunch of annoying pins that kept White from doing anything. After Black wins the f-pawn with 21...Nxg3, White's rook activity maybe compensating just enough. Black does seem to throw away winning chances later in the endgame, and I wonder if anyone can clarify for me if Black already knew that a draw would win the match?! For example, 41...Rxd5 just immediately allows a drawn 3 vs 2 on the same side rook and pawn endgame. I predicted a draw, and that is what we got. 1.0 prediction points for me. Ilya, eager to get his own attack on, played 32...a5?, overlooking the strong 33.Bb5!. It is hard to blame Ilya, this is a good move with deep enough implications that white had to find quickly. Now, 33....Bc6 looks like the only try (else bxc3 is an immediate threat), but 34.Bxc6 Rxc6 (34...Qxc6? 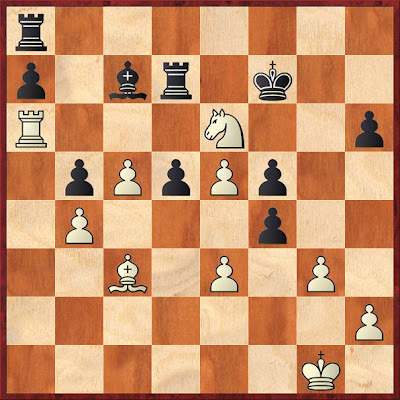 lets the Bishop on c3 hang when White has time to defend b2 and the b-file) 35.e5. The point is that if 35... dxe5? 36. bxc3! bxc3+ 37.Nb3 and Qxe5 is going to do it. Trickier to see is that after 35....d5, 36.Qg2! threatens to penetrate on those weakened dark squares (again with the weak squares behind the Bishop), and Black will probably have to contort his position to the breaking point to stop it. Also see how the Bishop on c3 is oddly trapped there. So after 35.e5, perhaps the best is to play 35...a4, trying to keep Black's attack alive... this is beyond what I want to cover now. Unfortunately, after 33...Bxe4, Black's position quickly crumbles. Well, I had fun making my predictions (final score this week 2.9 out of 4), and thinking about the results. Please feel free to add or detract from my observations. Good luck to the Blitz next week. I'll try to keep posting, so stay tuned. Tonight, The Boston Blitz come into their match 2-0 against the 1-1 Dallas Destiny. Everyone who followed the USCL last year knows that Dallas defeated Boston in the Finals to take the coveted 1st place honors. The big sparks in that matchup came in the game between Jorge Sammour-Hasbun and IM Kuljasevic, which was voted a well deserved Game of the Year, when Jorge repelled Kuljasevic's savage piece sacrifice with creative play of his own. Tune in tonight to see one of the exciting matches of the year. Later this week, I'll recap how my predictions have succeeded or failed. Open to all BCF members but only those who have been members for at least 30 days prior to the meeting (9/21/08) can vote for nominees. A good opportunity to renew your membership! Take the time to attend. The Club can't function without your support and participation. One of the perks of playing at the BCF is that you don't have to lug a set with you. The BCF has plenty of triple weighted sets with boards all waiting for you to show up and use. Also there are many analog clocks at the club; so you don't need a clock either. Although many people bring their digital chess clocks. Occasionally players will bring their personal set and board and use it. Eric Godin has a particular board he prefers to play with, while Tom Sifter brings a beautiful wooden set whenever he plays at the BCF. Personally I have four chess sets: my oldest son gave me a beautiful wooden set as a present about a dozen years ago and this is my primary playing and practice set. I also have a common plastic set, that was my original primary set, but that set has been "bughoused" : the black pieces are the same color but the white pieces are three varying shades of white. This happened to my set several years ago at the Quincy Chess Club when a group of us played bughouse into the wee hours of the morning; only to find the next day, or a week, or sometime later; that your set is not quite the same. In fact that specific night is recalled as "The Great Bughouse Fiasco" to this day. Players sets now contain pieces that are dissimilar. Andy Gunderson now marks the felt bottoms of any set he acquires with a common symbol so he easily re-collect his set by turning over to recognize his pieces if bughouse breaks out. In addition I have a replica of the Isle of Lewis set which I occasionally use with family, because the human figures give a realistic look to the battle (christmas gift). Another christmas gift is my Red Sox/Yankee chess set which I have left in its original package unopened; perhaps it will accrue in value for the estate. A game with this set would look more like the bench clearing brawl of May 20, 1976 when Bill Lee injured his shoulder fighting Mickey Rivers. Since the Yankees and the Sox have had many other bench clearing incidents, I guess they are the most appropriate two ball teams to use if you would wanted a baseball figurines chess set. In order to create a Boston Blitz vs New York Knights chess set, we would have to increase roster size but it would be cool to play a chess game with figurines of chess players. A bench clearing brawl between the Blitz and the Knights would have to include a Lemans Start and rendezvous at Hartford until the internet technology is perfected to allow e-dope slaps and e-shoves. Today everyone brings a fairly decent chess set with them to tournaments. It's uncommon that people arrive without a set. Probably 25 years+ ago I saw John Curdo playing a strong player with a Milton Bradley hollow piece set on a checker board?! What would your favorite chess set consist of? The Boylston Chess Club’s own NM Alex Cherniack has achieved one of the very coveted honors available to New England chess players this Labor Day weekend, 2008. His name will be immortalized on the New England Open Championship trophy on a small plaque that will sing his praises until Kingdom Come. I (Paul MacIntyre) and Libardo Rueda roomed with Alex this weekend, and our perspectives on chess were changed by the experience. Once we thought that great tournament victories were achieved by parabolically approaching perfection. By the end of the weekend, Libardo was explaining to me that chess was just a game of chance guided by freak accidents. I have nothing but respect for Alex Cherniack’s chess game, and have been blown away by his skills on a number of occasions. 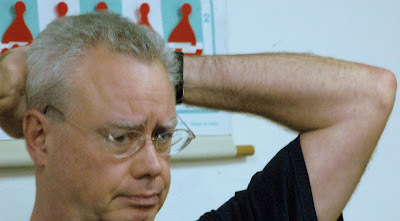 At a recent Continental Open, he brilliantly smashed GMs Wojo and Kudrin in succession playing darn near perfect chess. This tournament result, one of his best, was won in a most ironic fashion. 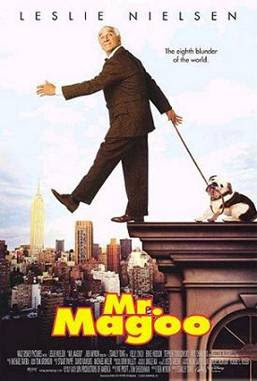 that nearsighted cartoon master of serendipity who is able to blithely walk off a building and somehow step onto a randomly swinging girder hurtling through the air, only to be deposited softly on the sidewalk unharmed. Alex started off with a good game in Round 1 paired down against expert Steve Brudno, who he beat efficiently enough. 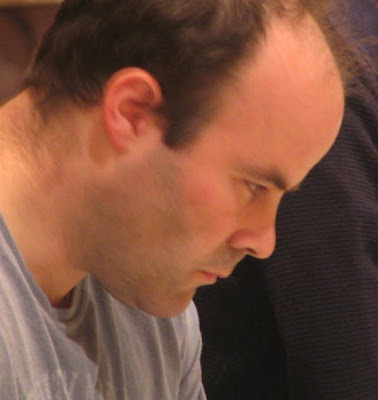 There followed his only loss which came in Round 2, an unpleasant one to FM Bill Kelleher who won following the simple formula, “pin and win.” In Round 3 Alex won against expert Sherif Khater, which required Sherif’s cooperation, but it was a relatively solid performance in which Alex was never lost. In Round 4 Alex was paired as Black against IM Vigorito. 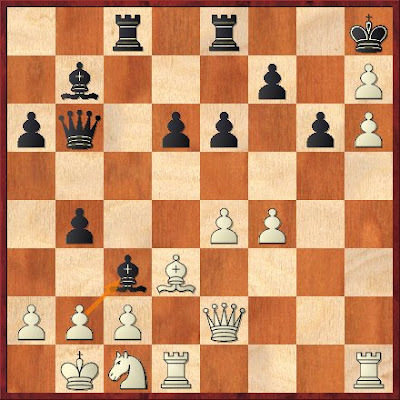 Alex played the Dutch Stonewall as Black, which against a player of Vigorito’s aesthetic sense is the equivalent of a “Yo’ Momma!” Dave confidently applied the thumbscrews, depriving Alex of all counterplay, until the following position was reached, assessed by Fritz at +– (4.12). Round 4, Vigorito–Cherniack, White to make his 38th move. Both 38.ef and 38.Nf4 preserved a large, winning advantage. However, Vigorito opted for 38.gf?? and saw nearly his entire advantage evaporate when Alex uncorked 38. . . .Rg8+ 39.Kf2 Rg6! 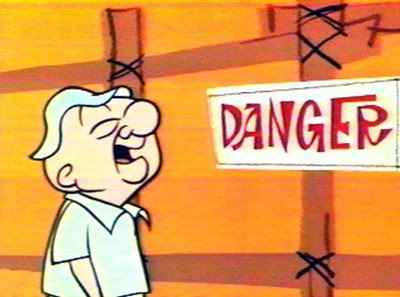 when, in improbable Magoo fashion, Black is holding on just fine. Vigorito took me aside and said he was going to have to kill himself, but I applied my suicide hotline skills and he is still alive and well. Round 5, Cherniack–Curdo after 13. Nxf5?? As if to test the level of abuse our chessic Magoo could take and still come out unscathed, Alex was paired against none other than GM Alexander Ivanov in the last round. Ivanov had drawn early and somewhat inexplicably with IM Igor Foygel in Round 5, but nonetheless could still have offered Alex a draw and left with sole first and the New England Open Title. But Noooooo! He had to play to crush Alex. Word was that Ivanov was sick of giving up rating points to lower rated players in such situations, and was hoping to boost his rating high enough to get invited to the U.S. Closed Championships. 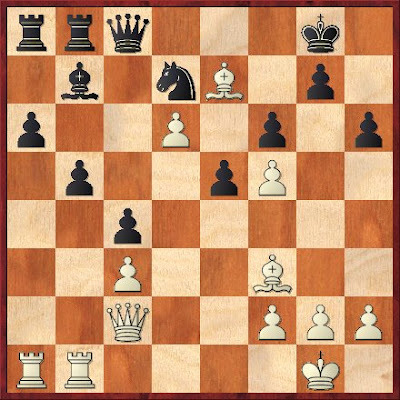 “The best laid plans . . .” In the following position, in time trouble, Ivanov decided to apply a hammer-like “coup de grace” to our rubberized hero and played to grab two minor pieces for the rook . . .
Ivanov played 26. . . .Rf3 27.Rf3 Re4, whence Alex Cherniack snapped the trap shut with 28 Qd5 winning the pinned Knight at f7 with checkmate to follow quickly. Ivanov resigned after 28. . . . Qc6 29. Qf7+. I guess Alex was lying low and, as he likes to say, “keeping his powder dry” for the right moment! All joking aside, a hearty congratulations to NM Alex Cherniack for his fabulous accomplishment! If you weren't invited to play in the BCC Championship, don't feel bad -- register for the hauptturnier. You play in a ten member RR under the same format as the championship and you can observe the championship games. The top ten by rating will be entered; if more than ten register, we may have a second section. Entry fee is $20 and entrants must be current BCF members.